If you’re just starting your record collection and don’t want to deal with complicated turntable setup, the Denon DP-300F is an excellent choice. You’ll sacrifice some sound quality for convenient features but you can always upgrade the cartridge later for better sound. The vinyl resurgence is here to stay and as a result, many audio companies are releasing new turntables. This makes choosing the right turntable quick tricky, as there are a ton of good options – especially for those first getting into vinyl. That being said, if you’re just starting out, the Denon DP-300F is an excellent choice because it's fully automatic i.e. you can simply press a button to start and stop playback rather than physically move the arm. It also means that when you’ve finished one side of the record, the tonearm automatically lifts and returns itself to resting position, preventing premature needle wear. While audiophiles won’t be impressed with the $329 (about £245, AU$417) Denon DP-300F, beginners who aren’t looking for the best sound quality will likely find its sound good enough, especially for those who don’t have high quality speakers or headphones in the first place. The DP-300F is an all-black turntable that looks borderline generic, yet manages to be beautiful at the same time. It's coated with a black paint that’s not quite piano black but almost a dark gray with what looks like metallic flake in it. The turntable is belt-driven, which means its Aluminum platter is well damped from motor vibrations. The plinth (the base of the turntable) is relatively well damped but it picks up more footsteps and vibrations compared to entry-level hi-fi turntables like the Pro-Ject Debut Carbon. The plastic tonearm is a straight design and features a replaceable headshell, making cartridge swapping simple. You can buy additional headshells and attach other cartridge and needles to experiment with the sound. Denon even includes an extra set of headshell leads in the box. Thankfully, the Denon DP-300F doesn’t require a manual belt change in order switch from 33 ⅓ rpm to 45 rpm. Instead, there’s a button next to the tone arm that you can press to switch between the speeds. While 33 ⅓ and 45 are the most common, there’s no support for 78 rpm playback, which isn’t a very common record format nowadays anyway but might've been a nice extra had Denon been able to squeeze it in. Next to the speed button are buttons to switch from 12” and 7” records – but if those sizes don’t work for you, you can manually queue the needle yourself via the tonearm lever. Our only gripe we had with the design of the Denon DP-300F is that the switch to toggle the built-in phono preamp on and off is under the platter, which means you’ll have to lift the mat and rotate the platter to access the switch. It’s a pretty minor gripe as you likely won’t need to hit that switch very often. The Denon DP-300F comes with Denon’s own DSN-85 cartridge and stylus, both of which are on the low end of the sound spectrum. As a result, the turntable produces average sound quality. Highs lack extension and bass doesn’t have the visceral impact of more expensive cartridges. Cymbals sound splashy and the soundstage is a bit confined, but you wouldn’t expect a $40 needle and cart to please audiophiles. Where the Denon DP-300F shines is in its easy setup and playback controls. If the prospect of manually queueing your turntable’s tonearm seem like too much work, you’re going to love the start/stop button on the Denon. In terms of damping, the Denon is about average. If you live in an apartment with wobbly floors, you’ll cause the DP-300F’s needle to skip since the turntable can’t isolate itself from quite as much vibration as more expensive decks. Again, you wouldn’t expect a budget beginner turntable to be great at damping. The only other downside, if you care, is that the Denon DP-300F doesn't come with a USB output for digitizing your records. However, many of today’s records come with codes to download MP3s of the record but crate-diggers may miss the USB-out feature found in the Audio Technica AT-LP120-USB. If all you want is to listen to your records and not have to worry about queueing, premature needle wear or digitizing your records, the Denon DP-300F should be at the top of your list. 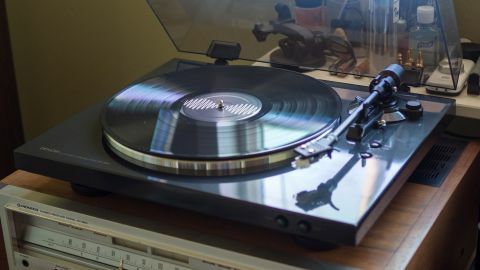 Its features get you listening to your vinyl records as soon as possible instead of having to fiddle with complicated components and manual queueing … just don’t expect it to sound as good as some other manual, entry-level turntables like the AT-LP120-USB or Pro-Ject Debut Carbon. For the price, the Denon DP-300F is on par with other entry-level turntables in terms of performance but bests them in terms of features. While there are cheaper automatic turntables like the Audio Technica AT-LP60, the Denon offers a better tonearm and lets you swap out cartridges, which the Audio Technica doesn’t. The bigger and more complicated Audio Technica AT-LP120-USB sounds a bit better than the Denon but at the cost of simplicity since it doesn’t have auto queueing. However, if you don’t connect with the Audio Technica’s styling or features, the Denon DP-300F is a great alternative.